Pictured, Bryce McIntosh and Noah McIntosh. Police bookings via Corona Police Department. 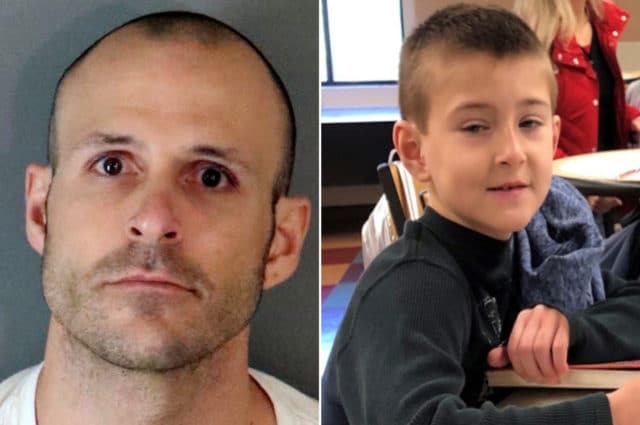 Bryce McIntosh- father of missing Corona, California boy charged with murdering his son, Noah, after trace evidence was found, leaving no doubt he was killed, cops say. The father of a missing 8-year-old boy in California has been charged with murdering his son after trace evidence was found, leaving no doubt he was killed, police said. Corona Police Chief George Johnstone told reporters during a Thursday press conference that Bryce Daniel McIntosh, 32, recently charged with child abuse, is now facing first-degree murder charges in the death of his son, Noah McIntosh, whose body has not been recovered. Johnstone said investigators responded on March 12 to a report of an at-risk missing child after Noah’s mother, Jillian Godfrey, said she had concerns about her son’s whereabouts, saying she was unable to contact Noah for the past two weeks. It remained unclear why Godfrey waited two weeks before notifying authorities. Police then tried to reach Bryce McIntosh at another apartment nearby, only to fail to respond to numerous attempts by investigators to reach him. The following day, a search warrant was served at McIntosh’s residence, where he was found with his 11-year-old daughter. But Noah was not there, police said. Relatives later told police that the boy was last seen in early March in the 4600 block of Temescal Canyon Road. Of note, Jillian had been living in her car at the same apartment complex where Noah and Bryce lived. She typically got to see Noah every Tuesday, Press Enterprise reported. New ‘trace evidence’ in the case after searches of locations in Temescal Valley, Aguanga and Murrieta led to the upgraded charges, according to Johnstone, who declined to provide further details, citing an ongoing investigation. He reiterated that Noah’s body had still not been found. ‘The Corona Police Department will continue to investigate the disappearance of Noah and will remain steadfast until Noah is located,’ Johnstone said. It’s unclear exactly when the boy was killed. His father has not been cooperative with police and Godfrey has had limited information about his whereabouts, including where he was last seen, Johnstone said. It remained unclear why the father may have sought his own son’s demise. Investigators have determined a motive in the boy’s killing, Johnstone said, but he declined to elaborate. Was one year 8 old boy betrayed by Child Protection Services? Of further disconcert, Noah’s grandfather, Doug Godfrey, said he was worried about his grandchildren for some time and had even called CPS about a year go, asking for help. According to the grandfather, caseworkers determined there was no reason to take Noah away. Riverside County District Attorney Mike Hestrin said the first-degree murder charge carries a special circumstance of torture, making Bryce McIntosh eligible for the death penalty if convicted. ‘Rest assured, everybody up here is committed to getting justice for Noah,’ Hestrin said. Godfrey, 36, has been charged with child endangerment. She remains held on $500,000 bail. McIntosh is expected to be arraigned Monday on the new murder charge. His bail has been set at $1 million. BREAKING: Case of missing 8-year-old Noah McIntosh has taken a defining turn. A major announcement will be made at 10am and we will carry it live online at https://t.co/SukufiXmnl.